December 19, 2008 - Out of every 1,000 children born in the state of Tennessee, nine die within the first year. API co-founder Barbara Nicholson speaks on this alarming infant death rate in a Public News Service release. December 17, 2008 - As an organization, we will be devoting some extra time spent close by our families over the holidays and taking a much-needed break from regular API duties from December 22 through January 2. Attachment Parenting International would like to wish you and your family a happy holiday season, spent close by your families. It's been our privilege to serve your families throughout the year and we thank you for how you have served API too. Until 2009! December 17, 2008 - Did you know that a recent poll of parents conducted by Parenting magazine indicated that 42% share sleep with their infant at least part of the time? Read more about API's Safe Infant Sleep Campaign. API's Safe Infant Sleep Brochure is now available for download. 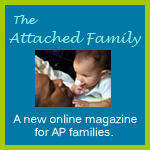 December 15, 2008 - The Attached Family, a new online magazine for Attachment Parenting families, has been redesigned. In addition to the new look, Editor Rita Brhel has updated the site with several new articles. Access to the articles that appear in The Attached Family online magazine is one of the many benefits that API members receive. For a full list of membership benefits, please visit the API Memberships page. Opposing Views -- Should Women Breastfeed in Public? December 10, 2008 - Author Elizabeth Pantley is participating in an Opposing Views debate - Should Women Breastfeed in Public? For more information on the purpose of this discussion, read this post on the API Forums. December 5, 2008 - The winners of the AP Month Photo and Essay Contests have been announced. Congratulations to Kelly Coyle DiNorcia for her first place essay, "What if...?". Jennifer Swartz's essay,"The Way It's Supposed to Be" was the second favorite. Julie Hudson, author of "Giving Our Children Presence", and Deanna Spangler, author of "Grief and Presence", received an Honorable Mention for their submissions. 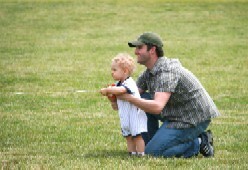 In the photo contest, Gaynell Payne's "Father and Son Flying Kite" picture was chosen as the favorite photo. Nannette Powell's "Mother and Baby in the Garden" submission was voted as the second favorite photo while Stacey Annand ("Face to Face") and Melissa Mailly ("Tandem Nursing") received Honorable mentions for their photo submissions. For more information, including a complete listing of the prizes, please visit AP Month Central. November 28, 2008 - API co-founder Barbara Nicholson discusses getting back to basics for the holidays in an article published on the Public News Service site: "Presence" Instead of Presents, WV Shopping Advice. November 17, 2008 - API has been quoted in the article Co-Sleeping: Is it Safe?, written by Liza Barnes, Health Educator at BabyFit.com. November 13, 2008 - In October, parents sent in their personal essays and photos defining what it means to give their children presence. A committee of API staff members has selected their favorites and now it is your turn to tell us who should receive prizes, which include a free one-year membership to API and a book by an AP expert author. Additionally, the winning essay will receive a special spotlight in the new The Attached Family Magazinedebuting in the spring of 2009 and the winning photo will have the opportunity to grace the cover of the magazine. Please cast your vote in the AP Month essay contest and the AP Month photo contest. November 1, 2008 - Thank you for making our very first Attachment Parenting Month a success with events taking place in 14 different states! Stay tuned to AP Month Central to learn the winners of the photo and essay contests which will be announced later this month. API would like to thank all of the AP Month 2008 sponsors: Mothering Magazine, Ask Dr. Sears, Infant Massage USA, Mommy Matters, Amby Baby, Infant-Parent Institute, Bless You Mom, Hip Mountain Mama, Attached At The Hip, the Natural Parenting Center and Binsi. Though Attachment Parenting Month 2008 has drawn to a close, API is available year round providing parenting support as you continue to carry out the theme of "Giving Our Children Presence." Please help API tell the story of AP Month and continue to create awareness by sharing details about your event using the AP Month reporting form. Individuals, API Support Groups and organizations can still make fundraising contributions and donations in support of AP Month. Report forms and contribution information are available at AP Month Central. "Giving Our Children Presence" is a timeless gift and to continue giving our presence to you as parents, we'll be offering member specials through the 2008 holiday season. October 7, 2008 - Did you know that Mayor Bloomberg of NYC and Mayor Hickenlooper of Denver, Colorado, have signed API's AP Month Proclamation? Learn more about these exciting announcements and our wonderful AP Month partners and sponsors, AskDrSears.com, Infant Massage USA, Mothering Magazine, Gena Kirby, and Amby Baby, or find an AP Month event near you atapmonth.attachmentparenting.org. Mothering's Co-sleeping webinar now available online! September 18, 2008 - Mothering Magazine's inaugural webinar featuring James McKenna, Lysa Parker, Barbara Nicholson and Paul Fleiss is now available online. Enjoy this informative session that deconstructs many of the myths about co-sleeping. September 3, 2008 - Attachment Parenting International advises its members and supporters that information submitted via the API web site is part of a secure process and is not affected by the status of the web site. We do apologize for any inconvenience for the recent unavailability of the web site caused to you, our members, leaders, forum users, donors, advertisers, and other supporters. With assistance from kind volunteers and our web hosting service, API has taken the necessary strategies to assure the security of the web site against malicious tampering and ensure uninterrupted service to you. Thank you for your patience and continued support of Attachment Parenting International. BOLD announces over 100 performances of Karen Brody's Birth during month of September. August 29, 2008 - BOLD, comprised of local grassroots childbirth activists, is alarmed by a recent resolution this summer sponsored by the American College of Obstetricians and Gynecologists and adopted by the American Medical Association suggesting home birth and "lay" midwives are not safe options for giving birth despite clear medical evidence to the contrary. BOLD challenges this assertion and believes resolutions like this significantly jeopardize the right every woman has to make the birth choice that works for her. The largest, most respected study of home births from the British Medical Journal found that among 5,000 low-risk pregnancies, babies were delivered just as safely at home with a certified professional midwife as in a hospital. API declares October Attachment Parenting Month and announces the theme: "Giving Our Children Presence"
August 28, 2008 - "More than ever, parents are seeking to offer their children every possible advantage, and research confirms the immense emotional, social and cognitive benefits to children from receiving one-on-one, unstructured time with their parents," said Barbara Nicholson, author and Co-founder of API. "Today's busy schedules can be quite an obstacle for families seeking quality time, and Attachment Parenting Month, with its theme of 'Giving Our Children Presence,' emphasizes the importance of -- and ways to achieve -- these moments." Attachment Parenting chapters across the country are recognizing Attachment Parenting Month through local events spotlighting the importance of giving children presence. In honor of Attachment Parenting Month, API Co-Founders Barbara Nicholson and Lysa Parker will be making appearances at several conferences across the nation and launching their new book on Attachment Parenting, Attached at the Heart. API will hold online events throughout the month, including a blog carnival, book club, and a national membership drive to help spread the word about the importance of parents' presence in the life of a child. August 22, 2008 - This month, Childbirth Connection released its latest New Mothers Speak Out survey report, in which researchers explored the increasing diagnosis of Post-Traumatic Stress Disorder (PTSD) among postpartum mothers. Read the report, or The Wall Street Journal's article. August 9, 2008 - Infant Massage USA today announced the release of a video produced by Discovery Communications, and featuring IMUSA Executive Director Linda Storm, on Discovery Health Channel's Deliver Me web site. The video, titled Deliver Me: Baby Massage, spotlights the benefits of infant massage in addition to providing instruction on how to massage an infant. August 6, 2008 - Participate in a survey put together by API Resource Advisory Board Member Kathleen Kendall-Tackett and Thomas Hale to help document Mothers' Sleep and Fatigue. This study is open to allmothers with babies 0-12 months old. August 5, 2008 - Please help support our friends at the Center for Effective Discipline as they debate "parenting expert" John Rosemond on the question Is spanking an effective form of discipline? Go toOpposing Views and vote in the poll and/or leave a comment sending a clear message that spanking is neither humane nor effective as a means of disciplining children. Please feel free to quote directly from API's Practice Positive Discipline Principle as you make your argument against spanking. July 21, 2008 - Carla Moquin, President of the Parenting in the Workplace Institute released a new how-to-guide to help parents who want to bring their infants to work with them. Moquin was recently interviewed on API Speaks, the blog of Attachment Parenting International, about the new guide and her work to give parents who return to work more childcare options. July 21, 2008 - Scotland's National Health Service plans to release new breastfeeding guidance for mothers later this year, including the recommendation that "babies should be given only breast milk for the first six months, and then continue to be breastfed for a further 18 months while they are eating solid food." July 10, 2008 - Chattanooga Times Free Press journalist Tabi Upton weighs in on the benefits ofAttachment Parenting in her article titled Parenting strategies for today. The article summarizes the Eight Principles, and concludes with "All in all, we know that bonding through nurturing touch, attention, education, and leading a balanced life can hardly be a bad thing for a baby. And the rest of us might benefit, too." Thank you Tabi, we wholeheartedly agree! June 23, 2008 - API applauds England's new "Equality Bill," which makes it an offense to stop any woman from breastfeeding a baby up to the age of six months. Read the full text of the story. API protests NBC's planned airing of "The Baby Borrowers"
June 21, 2008 - API has informed NBC of our strong objection to the airing of The Baby Borrowers, a so-called reality program placing infants and toddlers in the care of unfamiliar teens with limited to no childcare experience. API calls for the cancellation of the show scheduled to air June 25 based on its treatment of infants and toddlers and its violations of the United Nations Declaration of the Rights of the Child (1959). See the API Research Group response and find information to voice your personal response, too. June 20, 2008 - Co-Founders Barbara Nicholson & Lysa Parker were interviewed in the July/August 2008 edition of Natural Life Magazine for an article titled Babywearing: A Natural Fashion Statement by Andrea McMann. Read more about Natural Life Magazine on their web site. June 18, 2008 - API's membership and staff are saddened by the loss of La Leche League co-founder Edwina Froehlich, who passed away last week. Please read our tributes to this pioneering leader and friend to so many. Husband and wife duo launch "The Great Co-Sleeping Survey"
May 29, 2008 - The Fennells have been involved in promoting safe co-sleeping for many years. As parents of six and inventors of the Humanity Family Sleeper, they know first hand how misleading media coverage of co-sleeping can discourage families from using this important bonding and nurturing tool. Now they have launched "The Great Co-Sleeping Survey" to help raise awareness about co-sleeping, and how to do it safely. Please participate in their survey and check back next month for information about API's Safe Sleep Campaign. May 29, 2008 - API Parent Education Manager Marie Spadaro was featured in the Cape Cod Times last month in an article about the rising popularity of babywearing. Spadaro frequently wears her son, Gabriel, in a sling while teaching English classes at Cape Cod Community College. 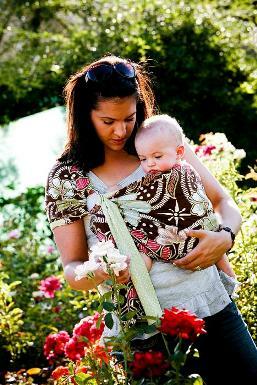 Read more about the rising popularity of babywearing. May 6, 2008 - A new report from the Foundation for the Study of Infant Death finds breastfeeding and co-sleeping can actually reduce the risk of Sudden Infant Death Syndrome (SIDS). Read the full comments by Lysa Parker, co-Founder of Attachment Parenting International. Parenting Expert: Go Ahead, "Spoil" the Baby! April 21, 2008 - When babies are crying, go ahead and pick them up. No matter what you've heard, they can't be "spoiled," according to a Tennessee parenting expert who is sharing tips as part of April's "Month of the Young Child" activities. According to Lysa Parker with Attachment Parenting International, research shows that early experiences "wire" the brain, and babies learn how to trust and be calm based on the responses of their caregivers. They are not capable of learning to soothe themselves, Parker explains. This is a behavior that parents and caregivers must model. Read the full article about Lysa Parker's statements. April 21, 2008 - Attachment Parenting International is pleased to announce its new Executive Director, Samantha Gray. From KPMG to the Peace Corps, from business owner to AP mother of three, Samantha has a lot of experience to offer the organization. Read the full release. April 18, 2008 - Mother's Day is May 11th this year. Are you prepared? API can help you remember and honor all the special mothers in your life by sending them one of API's exclusive gift packages including customizable, published dedications. Visit API's online store to participate in this special program and check our Mother's Day page at the beginning of May to see your dedication listed! April 17, 2008 - Attachment Parenting International is pleased to announce its new blog, API Speaks. Like so many of API's other offerings in the realm of education, research, and support, API Speaks is volunteer-operated and provided as a free service to the AP community. Our mission is to capture the real stories of life as an AP family and to highlight the fact that, despite all the varied family structures, cultures, religions, and dynamics that exist in the world, there is one thing that unites us: Our love and compassion for our children. April 9, 2008 - API member Kay Knight was interviewed by the Nashville Parent in an article entitled "Different Strokes." Read the interview. April 2, 2008 - Watch the video here. March 31, 2008 - Attachment Parenting International (API), a non-profit global network of parenting support groups with more than 60 chapters in North America, today announced its expansion from support into education with its new Parent Education Program, a comprehensive series of parenting classes that educate parents in a new way as it aims to make a long-term difference in parenting behaviors. 3/31/08 - API Co-Founders Barbara & Lysa Discuss their New Book and a New Vision for APIhere. 3/31/08 - API Announces New Series of Monthly Web Events with Noted AP Authors Beginning in April. Review speakers and dates here. 3/31/08 - API Launches New Web Site with Improved Member Support & Resources and International Forum. Read full story here. March 27, 2008 - Dr. Bob Sears, contributor to the Sears Parenting Library and author of The Vaccine Book comments on the recent measles outbreak in San Diego, California, the AAP's statement on vaccine safety, and the recent pay out by the Vaccine Injury Compensation Program to a family whose daughter developed autism-like symptoms after receiving a vaccine on his web site: TheVaccineBook.com. March, 2008 - Read Marie's article titled Babywearing: The Benefits of Carrying Your Baby in a Sling here (PDF) or download the entire magazine in PDF here.